We are the agency that stimulates your senses. We create communication from the point of view of emotion, experience, feelings and our senses. 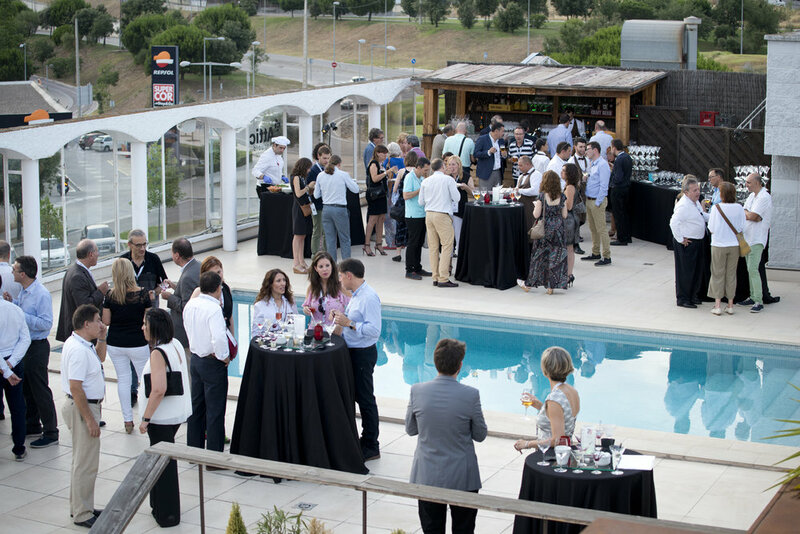 We think of concepts of marketing, communication and events, creating different, deep and effective experiences. The impact of using olfactory stimuli is well above of the rest of the senses. There are many possibilities: scenting events, POS, graphics and scented items, corporative odotypes. We enable companies to create such projects, with social impact, using its brand and its resources. We create these projects because we like helping people, give us value as a company and as an individuals. 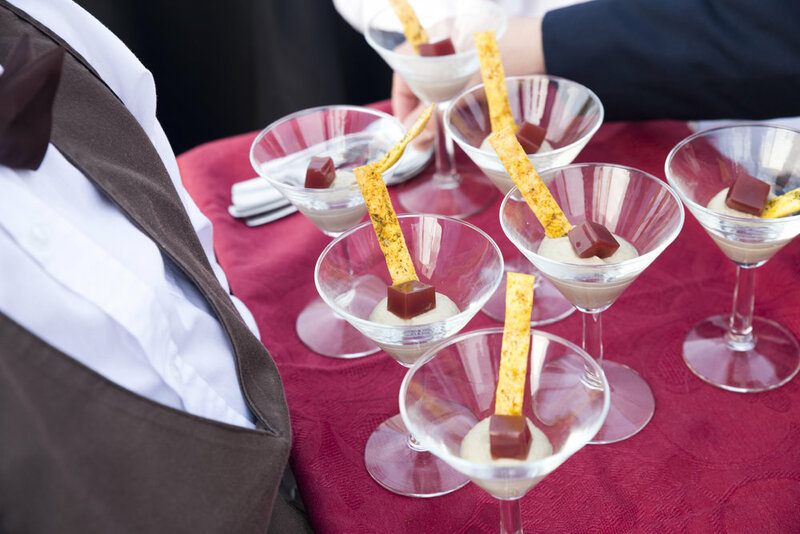 We produce events where we integrate the 5 senses at the service of the brand / target / product. In this way we get a broadband communication and the brand message reach as never before. 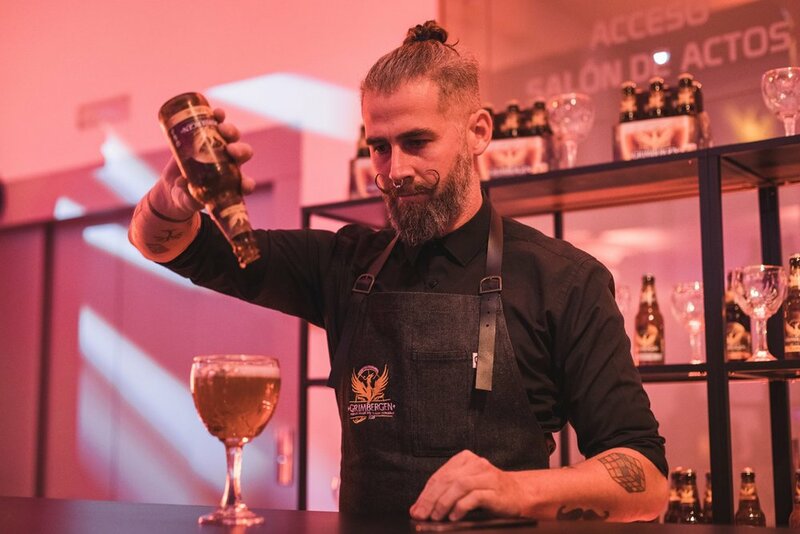 Grup Barcelonesa, a Barcelona based company with over 2.000 customers around the world, wanted to have a special vip event celebrating their 75 year of history; something classy, emotional and not very corporative. We produced the whole event and took care of everything. Transmit their story in a kind and different way. Special event without obvious corporative messages. 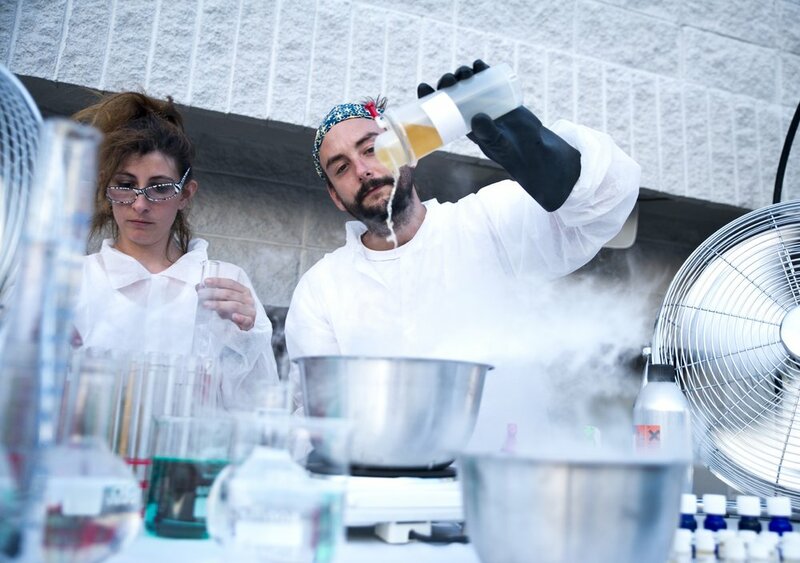 A chemical based event to tell that story in a subtle way using the interactivity and storytelling in the wall, the catering, the staging and other elements. 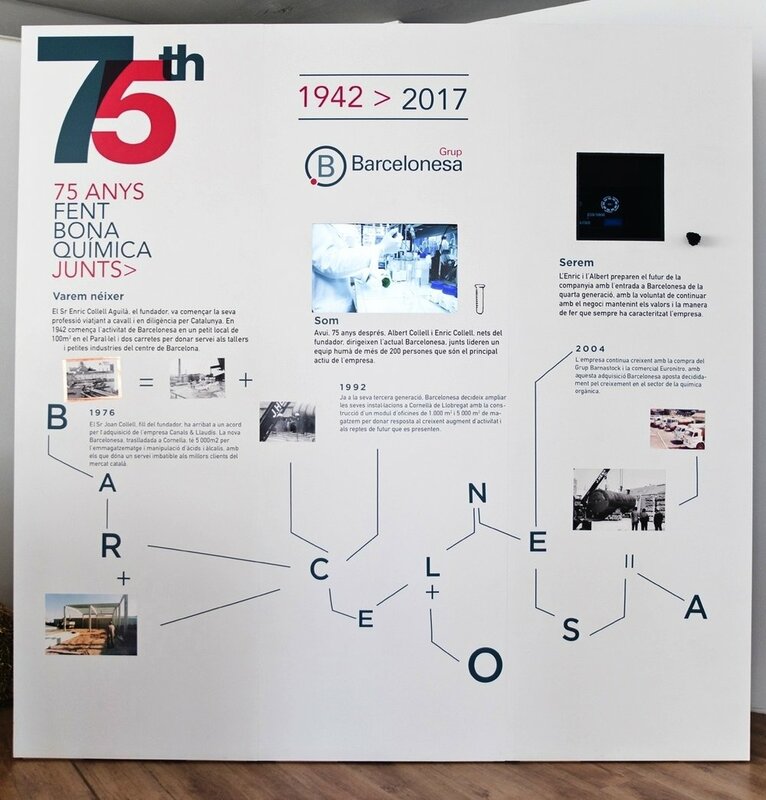 To tell the story of Grup Barcelonesa we built an interactive 2'40 x 2'40 m. wall and design the "Barcelonesa Chemical Formula" to connect all the elements in it (texts and interactive). We divided the content in 3 parts: origin, today and the future. In each part a little piece of information was provided along with the interactivity and the content created ad hoc. They were also another 3 milestones connecting between this 3 moments. The sounds of the old factory triggered by touching the pics. We created the audio content too. A painted test tube has the ability to start a video. We edited a corporate video provided by the client using the most dynamics images and also added some graphics. A future looking quartz will reveal a hologram. We created both the sensor and the hologram content. The 3rd edition of the festival was an upgrade on quality and infrastructures. 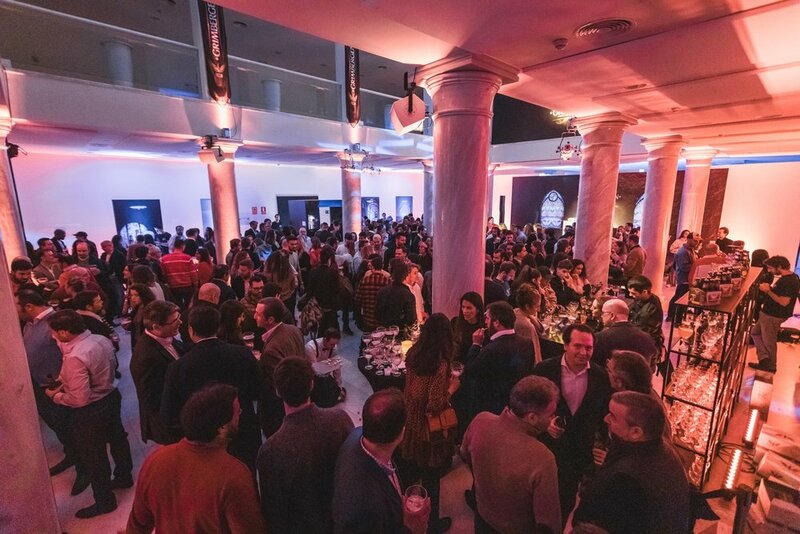 Over 1.100 people from 21 different countries gather in Barcelona to enjoy this unique atmosphere and vibes. 2 days festival on 2 different venues plus the skate park and the dance studio workshop areas. Friday evening at “La carpa” in Poble Espanyol: a 700 sq metres dancefloor. We also had a sector market area, food trucks and picnic area and a NetRolling session. A huge roller disco with a massive light and sound system and several shows (including the European champion of artistic roller). The whole Badalona promenade, 260 metres long, right by the beach. 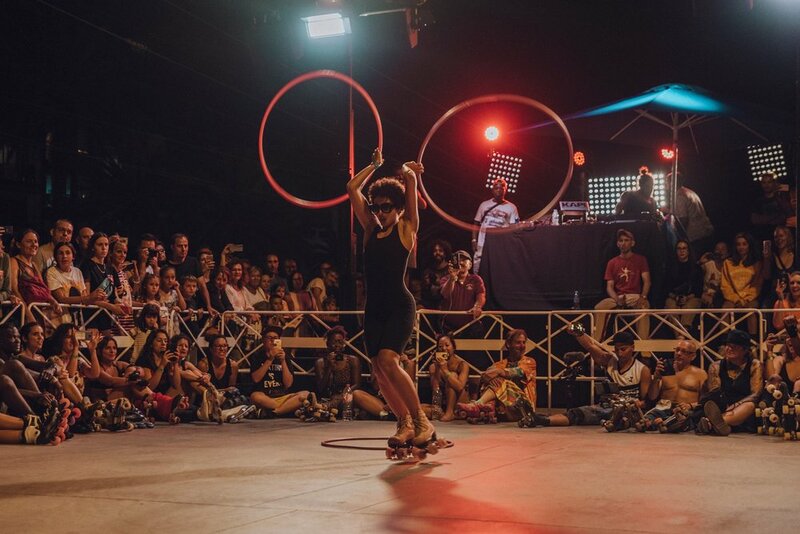 Food trucks, bar, market, art, activities, rink and dancing areas; at the back of the stage a workshop area and a spectator zone to check out the amazing skills of the rollers. The best artist and teachers from around the globe gather in Barcelona to share their knowledge: disciplines from artistic, dance, kids, clown, inline dance, bowl, acrobatic, hula hop, hip hop dance…..
Medtronic (APV division, "Aortic, Peripheral and Venous") leader in medical technology, services and solutions, came to us with the problem of having several platforms and formats for their sales and tech team, a very problematic updating on info. Get all the relevant information in one place. Connect the doctors with medtronic in an easy way and also other colleagues. A platform containig everything, where APV specialist can check all the information they need about any product. A place where they could start a conversation and share their knowledge, where information its customize and direct connection with the Medtronic area specialist. A platform in the shape of an app that contains all the information, in all formats, with easy and immediate updating. Videos with real cases and product 3D animation, all the technical products sheets and info, patient book, clinical cases, workshops and other gatherings, and news. Also doctors can get in direct contact with their designated medtronic person throught the app. Throught registering, and filling some quick data, the app will get the info customize for each doctor based on interest area, location and hospital. * We're currently working on the mobile version, in english for the rest of european countries, and an inside platform that can be used by surgeons to share knowledge about their expertise on Medtronic products. Panme is a collaborative music experience for Sonar+D 2014, in which we collaborate, taking care of all the audio process, with Glassworks. The software includes face tracking and facial expression-detection technology on an ipad. Every user’s head movements and facial expressions allows them 4 users to create music in real time interacting together. A retro holographic screen depicts the jam session that is being composed. 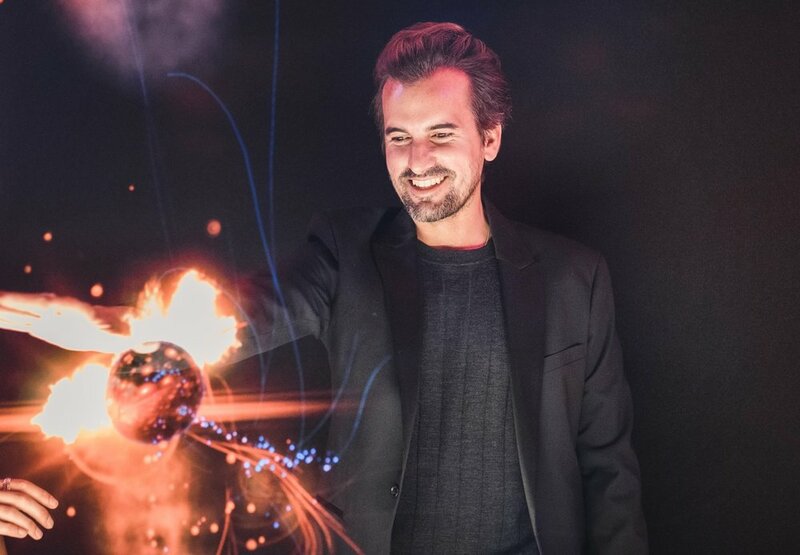 The installation continuously takes pictures of the users so they can see them after in a 3D screen as a slideshow control by a “Leap Motion” sensor. La Agencia Sensorial was responsible for all the audio process in the installation: creating, designing and the layout of the content, audio UX, audio space design (hardware). Aditionally we placed popcorn scent as the users seated on authentic cinema seats. How cool will be to walk inside the aorta to perform a surgery! Our project included a very tech design of the images, 3D and overlap graphics, a massive set up of 10 metres long with a 9 square metres plus all the lighting, scenting and tactile surfaces. 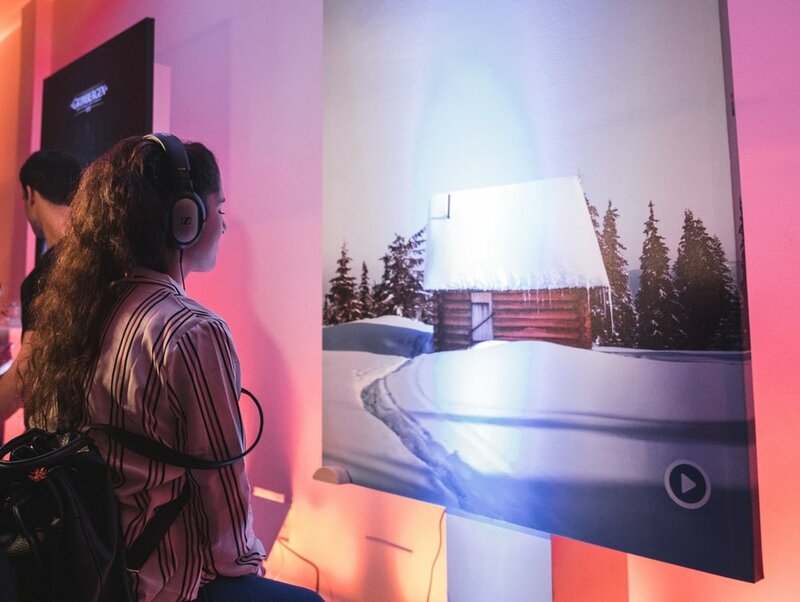 Their technology is already well know by the surgeon community and they want to show in a different way, that’s why we created this gaming, interactive and immersive experience. Medtronic technology allows surgeons to arrive very close to the heart, through the veins, and deploy a net that will prevent the aorta to close provoking a stroke; this technology is way less invasive and less risky than an open heart surgery. Team: 15 people to develop / 7 people on site. Client: Medtronic Europe (Business case). 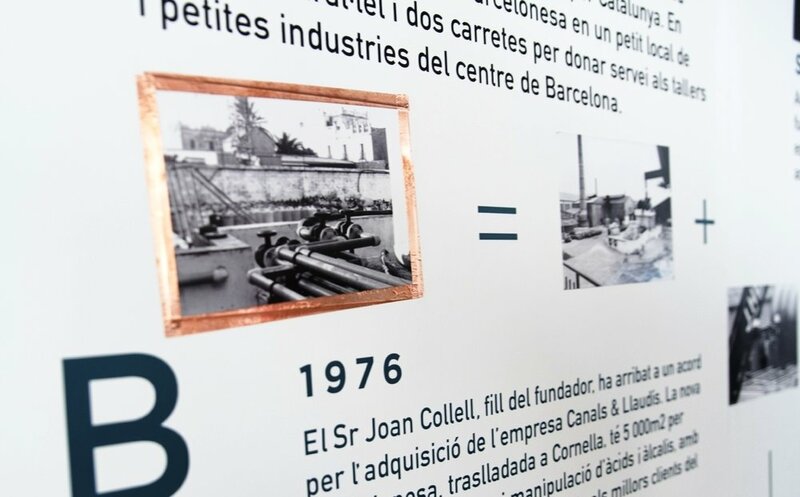 To support the media campaign of the car, an installation to show de model was placed at the busy Airport of Barcelona. We used 4 scent devices integrated in the structure in which the car was placed; having online control (IoT) allowed us to adjust the intensity, once in place, without accesing to the devices. We managed to scent the huge and impressive entrance hall of the new terminal for 2 months. Client: Audi / Dicom Events. In the ocassion of Bilbao's White Night 2013 we designed this projection over trees to promote the Durrio Gaugen exhibition at the Museum of Fine Arts). We took care of the art direction, production design, mappings, and set up. We recorded the actors who embodied the characters. Once in the studio we performed the necessary editing also with audio in Castilian and Basque. On location, the trees that were to be used as actors-screen were chosen with a set up including layher towers, projectors and sound. Team: 2 people / 9 people on site. 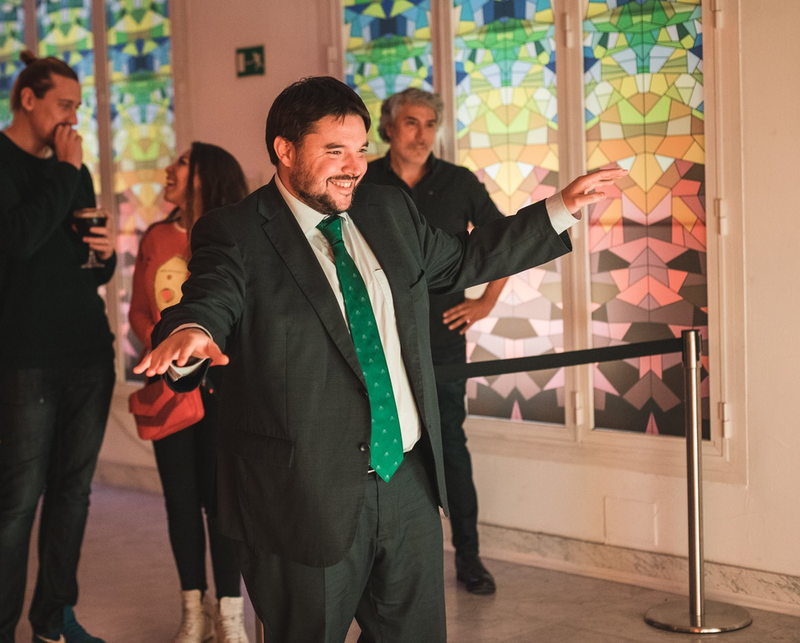 The installation allows the user to interact and control, throughout their mobile devices, with all the elements as video mapping, colouring, audio and also the scents that are projected on the space for the first time. We gather different technologies to make it possible, such as: dmx control scent machine, mapping, interface design and interactive process, interactivity connection protocol through all the devices involving the process. Team: 7 people / 4 people on site. Performance for the presentation of the new image of their cosmetic line "Repavar". 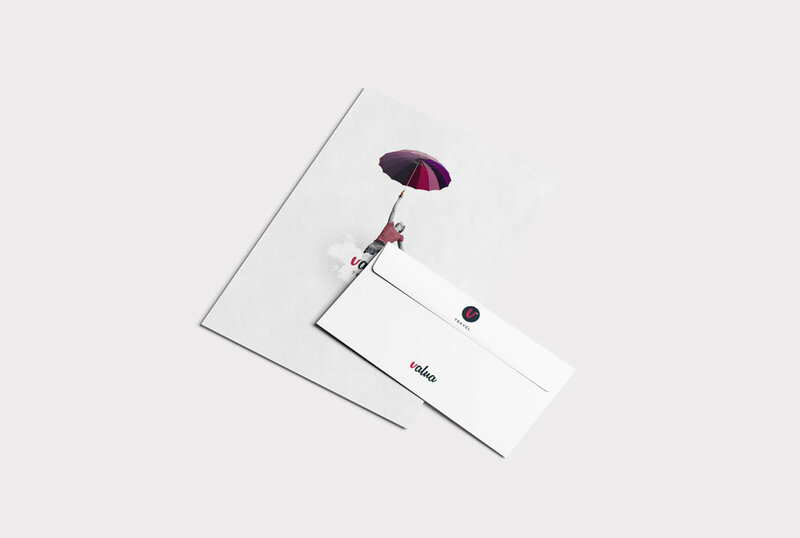 Objectives: presentation of the new brand and product line that secure them at the forefront of the sector; impact and transmit this corporate advance to the sales team and distributors; conceptualize the images supporting the launching campaign. Resources used: synchronized catering (textures, ingredients and formats themed), lighting (over 60 spotlights, three towers, and technical controls), live cellist, original audio base created for the event (launch on real time), aromajockey (scetns in syncrhony with the food), more than 8,000 balloons, dancer with synchronized choreography (inside a huge pvc ball with ball of light) created for the event, scenting of other areas (hall and foyer). Team: 19 people on site. Because of the celebration of the White Night in Bilbao, we were in charge of the management and technical production and the complete design of installations and mappings, in several locations around town. • Deusto’s bridge, whose pillars were converted into two giant fish tanks. • Fine Arts Museum facade, with the screening of a video mapping using the most important works in the collection; the handicap of this installation, lay in the fact that it had to be mute, without the support of any audio effect or music to accompany the rhythm of the visuals, even so, the very strength of the pictures shown and our set up we achieve , that the passers by stayed to watch the 3 minute duration. 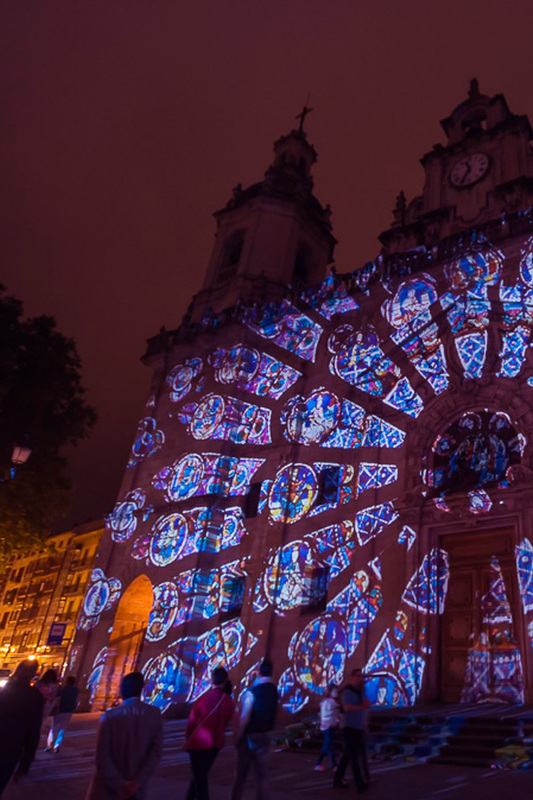 • St. Nicholas church facade, turned into a giant rosette window; we decided to use high-powered projectors, because he was going to be projected as fixed image, offering all the quality you get with this type of projection image. In this case, the projection was reinforced with Baroque organ music. Team: 2 people / on site 9 people. Each designer, each style, each collection translated in a different scent that was spread in the majestic "Tinell Hall" (Royal Palace of Barcelona). We scented over 600 m2 and 12 meters high, using our powerful canyon, with 3 charges of the same aroma, to ensure the rapid aromatisation of the space; also we used a cleaning scent in between designers to avoid the mixing of the scents. Team: 5 people / 2 people on site. Client: 080 Barcelona Fashion / Esma Proyectos. Glamour, classic and elegance were the values on which we work to convey its essence. A large an intense palette of colours to combine with the large amount of lines and tendencies for the year coming. We are responsible for the scenting of Coolway shops worldwide since 2010. Over several years we have used different fragrances to convey the freshness and youth of the brand: an explosive mix of kiwi, coconut and vanilla for summer and vanilla with bourbon for winter. We developed a special blend of red berries and spices that customers totally love. As part of the growth of the brand and with the aim of building loyalty, we were comissioned to designed the fragances and produced the bottels; we used a type of rubber, for the cap and the base, that recalls the soles of their shoes. A fresh and spciy, with a little touch of wood, blend for boys and a sweet, funky and deep finish blend for girls. Team: 5 people from the agency and over 15 external. An impressive structure by itself that can be customise 100%. 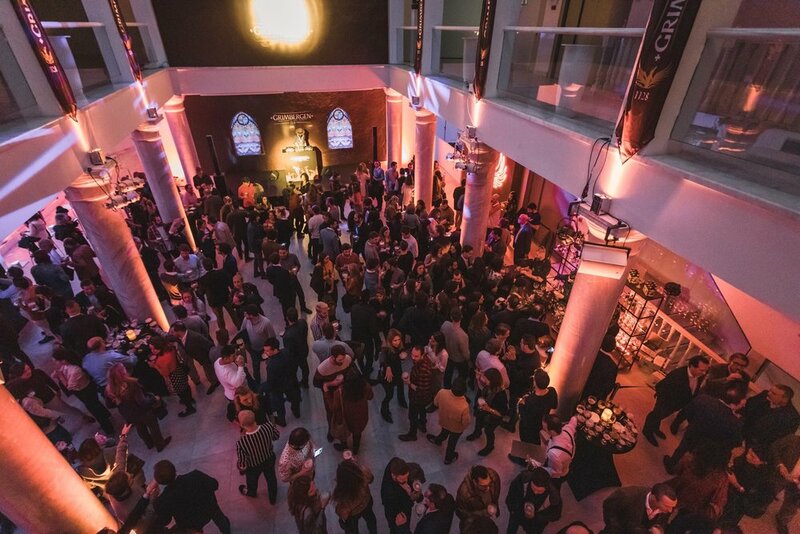 A whole world of solutions to create inmersive spaces conceptualise to your event/needs. Can be place indoor / outdoor. Visual warp on 9m2 screen with retro projection or frontal (also smaller projections available). Contents 2D / 3D / Interactive. Performing on stage a string quartet, two electronic musicians, a quartet of voices, a vj and aromajockey. Visuals are launch and mixed in real time as well as the scents and all the music. Team: 17 people, 12 on stage. * This is an agency project ready to be used; pics were taken on a reduced format show for a client. Sencity is a music event for deaf, hard-of-hearing and hearing yougsters. To make music accesible for everyone this is a multi-sensory event where the emotion of the music is transmitted through all the senses. There’s stimuli through real time scenting, visuals (always with written words), vibratory floor, magnetic inductive loop, sign dancers and many many other elements, and music obviously. With this approach music can be experienced by deaf and hard-oh-hearing yougsters. This is a CSR project that travels around the world. 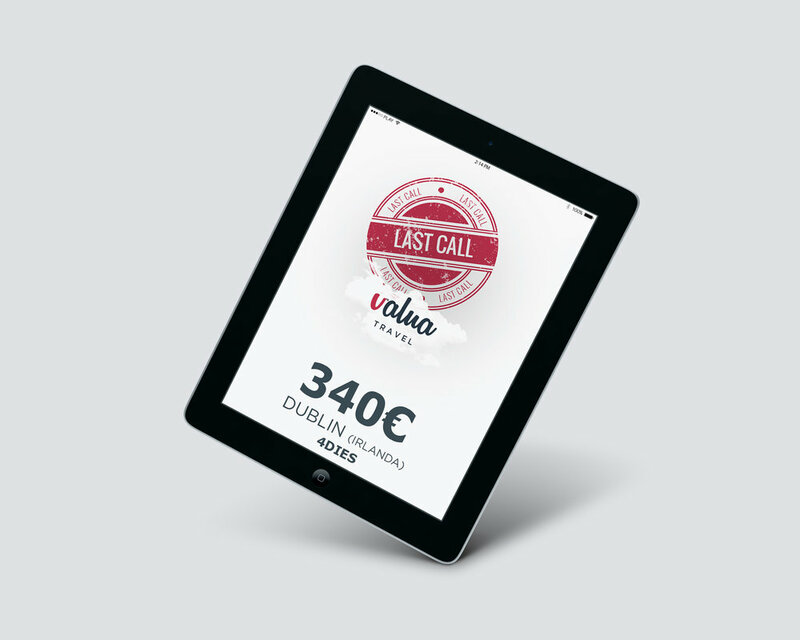 Valua is a travel agency for students. They divide their services into three lines: travel, languages and outdoor. 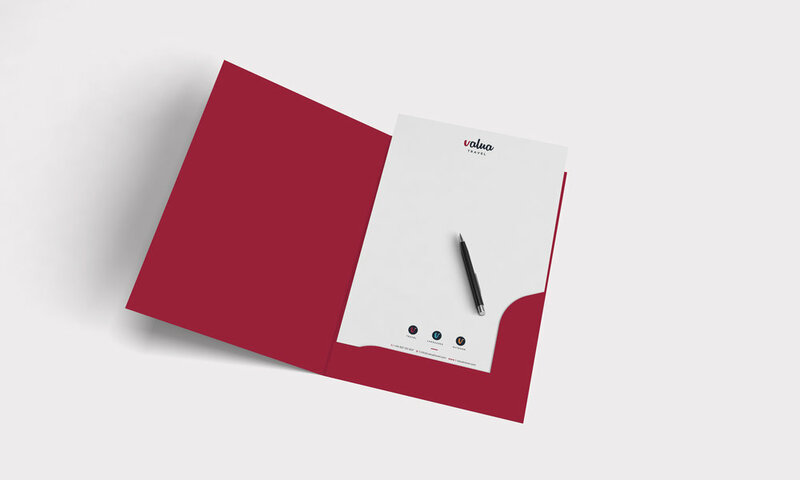 We created the branding concept and the corporate stationery. Valua wanted to give an image of stability and corporate solidity, without losing the sense of fun that entails his work. We make you fly! got to be fun. Imagination and a fresh and funky palette of colours. Imagination, cleanliness and color are the main values of this graph. Youngsters on cool illustrations to transmit the fun of the services. Humor was the key for the online communication. More than 800 proposals presented, we won. 5 characters, 5 flavours and the power of nature. The same graphic idea displaying the different character of their varieties. We took some pictures of colourful representations of aromas in the wines and products of the area, to begin with; them we adjusted the brand logo, that we created, into the shapes of those pictures. Each one had the logo on the palette of the photo to increase the importance of the image.